Melbourne contributor Kate @kateflatman checked out the Machines in Action Family Day last weekend at Scienceworks and couldn't have had a better day! A beautiful sunny day and an outdoor arena filled with Museum Victoria's collection of historic vehicles! More info regarding the day and tips below. Thank you Kate for the great review and pics - a fantastic day out! Scienceworks is such a delightful place to visit with little ones. 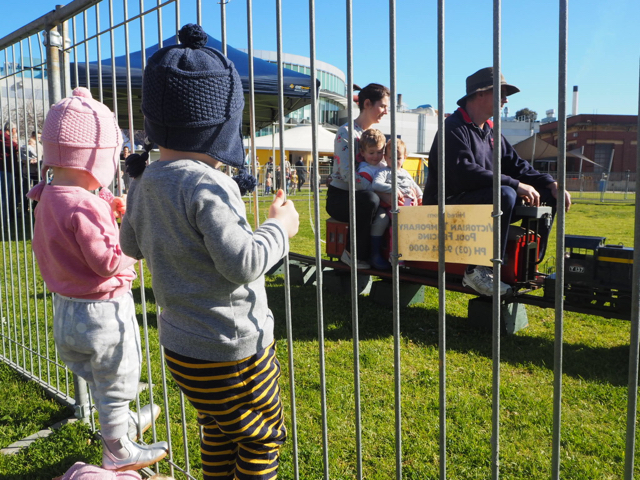 From the mini-metropolis Nitty Gritty Super City, to the Think Ahead and Sportsworks exhibitions and of course the extremely fun Little Kids’ Day In program held monthly for children aged five and under, it's guaranteed to be a fun day out. Held several times a year, Machines in Action (MAD) days at Scienceworks showcase Museum Victoria’s historic working vehicle collection. It offers a rare chance for children and adults to see these wonderful machines up close and to learn about engines and vehicles powered by steam. As we crossed the West Gate Bridge and arrived at Scienceworks, it was such a glorious, sunny winter's morning that we sidetracked all our usual inside activities and continued straight outdoors to the Arena. Arlo quickly caught sight of the working model steam train and it wasn’t long before we were enjoying a ride around the tracks with the Springvale Live Steamers (a group of model engineering hobbyists that operate a working miniature railway in the Melbourne suburb of Springvale South). The little trains were set for a big day of rides, but we were assured that they were up for the challenge. With the first parade not starting for another half an hour, we had time to visit the Heritage Machines Garage, located behind the Lightning Room. A few of the engines were already on display in the Arena but it was the fizzing and popping sound coming from the Cowley Steam Roller that had our little explorers running over to the garage keen to investigate. Originally leaving Cowley's Eureka Ironworks, Ballarat, in 1939, the restored Heritage Cowley Steam Roller is the last steam road roller manufactured in Australia and even carries the paint scheme it wore during its long working life. We stood by and watched as it was driven out of the garage and into the Arena, we even got a light dusting of soot on our faces as it went past! After a quick run around in the playground, we found a spot against the fence to watch the parade (Macy positioned her doll up on the fence so she could see too!). It was pretty incredible watching the historic machinery parade around the Arena. It was especially exciting to see the oldest machine to go on display - the Cowley Steam Traction Engine - which is the only one of its type surviving in the world . Built in Victoria in 1916, it certainly is incredible to see up close. Machines in Action family day was definitely one of the best events that we have been to this year; there’s nothing quite like a steam engine running in the sense that it creates a fantastic sort of smell and sound, which is part of their beauty. We cannot wait to visit again later this year and discover more vehicles from the impressive collection. Check the Scienceworks website and/or daily visitor map for an up-to-date timetable of scheduled activities. Model steam train rides are very popular so arrive early to avoid long queues. For safety reasons train rides will not run whilst the parade is in progress. If you plan to go on the steam train be sure to wear fully enclosed shoes. Speak to one of the MAD volunteers - they love answering questions and sharing their passion with others. Be sure to visit the other areas at Scienceworks while you are there. The Lightning Room and Planetarium shows are amazing but better suited for older kiddies. For more information about Scienceworks, checkout the Scienceworks' website.